A most beautiful and powerful crystal of the Violet Ray energy, Sugilite is a premier love stone for this age, embodying the perfection of Divine love and the manifestation of this energy on the Earth plane. It brings the gifts of wisdom and spiritual devotion, helping one to understand that Truth is the highest form of love, and living in one’s own truth is not only healing but empowering. Working with, wearing or meditating with Sugilite amplifies the ability to channel high frequency Violet energy into every aspect of one’s being in order to walk the Earth in strength and grace. Sugilite reminds the soul of its reasons for incarnating, and enhances one’s understanding of the lessons which have been chosen for this journey on the physical realm. An exceptional crystal for awakening the Crown Chakra, Sugilite infuses the body with light, bringing spiritual and unconditional love in through the Crown and down to the Base Chakra, aligning all of the chakras as it goes. It is a powerful attractor of healing energies, and has surfaced to further an awareness of the connection between the well-being of the mind and the well-being of the body. Its use helps counter the mental and emotional stresses that create many of the illnesses and diseases of the physical body. Sugilite ’s frequency allows one to recognize and release the harshness of the world, and to let go of sorrow, frustration, past angers and fear. It brings light and love into the darkest of situations, letting one know life is more than what is currently being experienced. It offers hope and optimism for a better future, enabling one to accept the here and now. Sugilite encourages forgiveness, of oneself and others, and instills confidence and a sense of freedom. It is an especially joyful stone for those who never quite fit in, and for light workers who find it difficult to adjust to the vibration of Earth. Sugilite is a relatively rare cyclosilicate of the Osumilite group, a potassium sodium lithium iron manganese aluminum silicate mineral. Its form is usually granular to massive, though rarely it forms in tiny prismatic crystals. It is named for Dr. Ken-ichi Sugi, a Japanese petrologist who discovered the first specimens in 1944 on Iwagi Islet, Japan. The mineral’s name is pronounced erroneously more often than correctly, usually with a soft "g" as in “gene” when it should be pronounced with a hard “g” as in “geese.” Specimens found in Japan were often a light brownish-yellow rock-forming mineral, classified and soon forgotten. 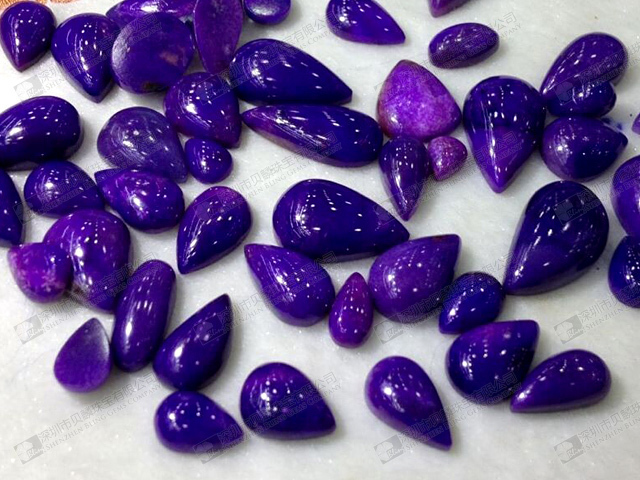 It is the bright purple lapidary rock found in South Africa that brought its gem properties to popularity, especially as a New Age Stone in the 1980’s. 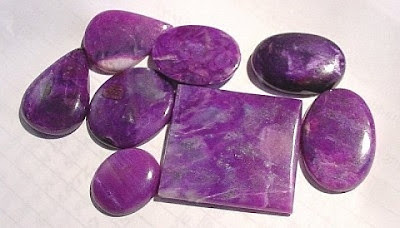 Its color ranges from pale lilac or pink, to reddish-violet into deep purple, with a rich magenta-purple shade considered to be the most precious, especially in the translucent form known as “gel.” Though Sugilite is found in Japan, Canada, and a few other localities, most deposits of this violet stone come from very deep manganese mines in South Africa. Sugilite is also called Luvulite, Lavulite, Royal Azel, Royal Lavulite, and Royal Lazelle. Sugilite is one of the very best crystals for those who are highly sensitive and take on whatever energies are around them. Wear or carry Sugilite to create a warm, protective shield of Light, keeping the wearer impervious to negativity and the disharmony of others. In times of discouragement or despair, place Sugilite on the Third Eye to draw in comforting energy and a flow of gentle, loving information from the spiritual world to bring peace and relaxation to the emotional body. Use Sugilite with strong layers of black manganese to relieve headaches and dispel pain, discomfort of all sorts, and general feelings of disorder. Simply hold the stone and allow the pain and negative energy to be transferred into the manganese and Sugilite. It may also be used for healing environments, and for use in crystal layouts. In order to keep Sugilite at its best, be sure to cleanse after use. 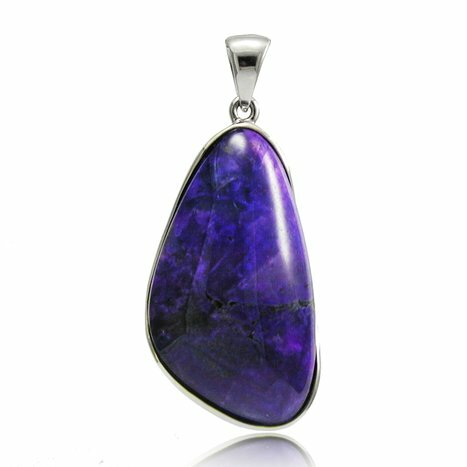 Wearing or carrying Sugilite encourages a wonderful sense of freedom, with love vibrating in all aspects of one’s being. It creates an awareness of everything as perfect, and in line with one’s chosen soul path. Its energy infuses one with inspiration, creativity and confidence, and enkindles the desire to release the past and move forward in peace and great joy. Sugilite is a marvelous stone for helping children feel safe and centered, and to adapt to the world around them. Place on a nightstand or under the pillow to counter insomnia, ward off nightmares, and encourage nurturing, vivid dreams. A small piece in a child’s pocket or backpack boosts confidence and eases social situations; it is also thought to provide extra support for children with autism, dyslexia and other learning disabilities, as well as those with extra-sensory gifts. 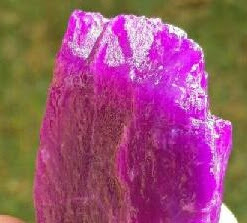 Pink Sugilite is good for resolving inner hurt, and can be especially consoling for adopted children who have tracked down their birth parents and were rejected. Pink Sugilite is a powerful love crystal, especially in shades of magenta or fuchsia. Wear as jewelry to attract a kindred spirit, and to avoid sentimentality in relationships yet encourage commitment in good times and bad. Pink Sugilite instills a love of life and the belief of inherent goodness in people. An excellent stone for spiritual quests, Sugilite protects the soul from all forms of negativity and enhances one’s psychic powers. It is particularly useful for increasing one’s channeling ability, and for releasing the pain associated with the loss of the person channeled. It may also aid in the psychic development of automatic writing. Journal daily using this stone to help open up this gift. Sugilite promotes an understanding of the mind/body connection and how illness and disease may result from chronic stress, emotional turmoil and lack of love. Its energy is believed to bring the nerve centers and brain hemispheres into balance, calming the senses and energetically releasing tension, fear, and psychosomatic dis-ease. It is thought to relieve emotional disturbances and psychiatric disorders, neurotransmitter glitches, or brain malfunctions such as dyslexia, dyscalculia, epilepsy, and motor dysfunction. It is a good stone for those suffering from paranoia, schizophrenia, or post-traumatic stress disorder. 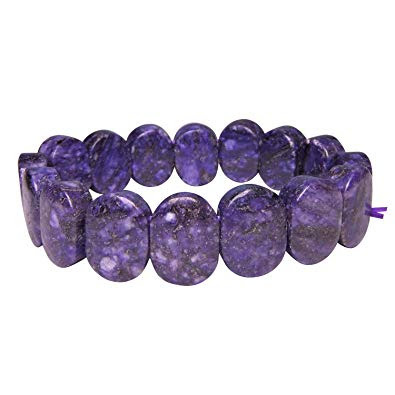 Sugilite has also been used to bring support for autism and Asperger’s syndrome, and to relieve insomnia and sleep disturbance. Manganese within Sugilite helps absorb negative energy and is an excellent pain reliever, especially for headaches, joint pain and discomfort. It may be beneficial for fighting off viruses and inflammation, and is one of the premier stones to aid in the treatments of cancer by lifting despair, calming emotions, and channeling healing energy into the body. Sugilite is a wonderful aid for eliminating anger, hostility, jealousy, and prejudices. It encourages forgiveness and helps cultivate the ability to love and be loved without neediness. It is highly supportive of working with groups, by resolving group difficulties and fostering good communication between all. Sugilite is primarily a stone for opening the Crown Chakra, not for escape into the higher-vibrational realms, but for drawing in and grounding Light on Earth through one’s own being. Its energy flows from the Crown down to the Base Chakra, opening and balancing all as it goes. Sugilite is a vital ally in connecting the mind to the wisdom of the Third Eye; and is highly effective at the Heart Chakra, stimulating a resonant love which can be felt by others and is in tune with the vibration of the perfect state of the universe. Sugilite is also able to connect the Third-Eye, Crown and Etheric chakras, in activating inner vision and the realms of dreams. Sugilite is perhaps the most powerful stone for calling in the Violet Flame of purification, a process of energetic cleansing and burning away of the gray spots in the auric field. Wearing or carrying Sugilite can remove negative attachments and karmic influences, and keep parasitic entities from the astral plane from remaining in one’s aura. It dislodges and dispels toxic influences from one’s inner and outer environments, and serves to speed up one’s spiritual development. Sugilite helps one explore the foundations of one’s truth and search the soul memory for answers to the questions, Why am I here and What am I meant to do? It can accompany one into past lives or the between-lives state to discover, forgive and lovingly release causes of dis-ease from the past, and to gain a new understanding of the lessons chosen for this incarnation. Sugilite further assists in determining ways to bring one’s gifts and special uniqueness to this world in order to be a beacon of spiritual light to others. Sugilite utilizes the Violet Ray, the darker hue of winter’s majesty, the time just after the winter solstice. It inspires awe, and invites a feeling of mystery and magic, nobility and luxury. It is one of the most powerful rays in nature, helping us interpret our dreams and inspiring us to great deeds and accomplishments. 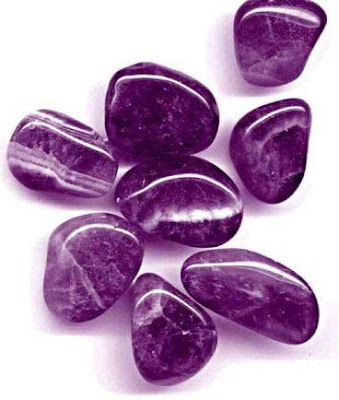 Dark violet crystals are dream talismans, providing insight and giving us a window to the soul beyond ordinary understanding. Lavender talismans, the lighter shade of violet, provide not only the wisdom of self, but focuses on our feelings and understanding our hidden yearnings. They’re crystals of the free, unfettered intellect and heart. Meditating with Sugilite gives one the ability to channel high frequency Violet energy into the mind, and the insights are astonishing. Its energy flows in and down from the Crown Chakra, bringing deep spiritual love and wisdom, as well as a marvelous flow of chi throughout the system. When working with Sugilite the mind becomes attuned to the spirit, directing its healing force back through the mind and into the body. Repeated use of this stone allows one to establish conscious control over the mental vision one has for the physical body and to tap one’s own infinite resources to direct and effect healing. For those suffering from chronic pain or struggling to discover their life’s purpose, daily meditation with Sugilite is recommended. Sugilite is also superb when used in conjunction with Amethyst and placed over the Third Eye center to usher the mind into meditative states capable of incredible wisdom, and to increase the effect of Sugilite’ s aura of protection.